Cauliflowers, just like all our products, are grown with farming methods that comply with the principles of integrated pest management. The production area is located between the following towns: Metaponto, Ginosa Marina, Bernalda and Montescaglioso, where we have about 150 ha and a year production of about 450000 packages. The varieties of this product are numerous and vary with the seasons. When cauliflowers are ready to be harvested, they are packed in the field, and selected in the two most popular calibers (6 pcs. and 8 pcs. per package). We package mainly cauliflower with leaves, but we can also package it partially or completely defoliated (in cartons, CPR, IFCO, even in stay fresh bags or plastic wraps). Later the product is refrigerated and delivered. 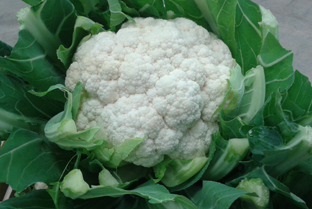 On clients’ request, we can package cauliflowers in IFCO, EPS, cartons or CPR.